The US secretary of state has warned Syria against interfering in Lebanon, following the killing of former Prime Minister Rafik Hariri by a car bomb. 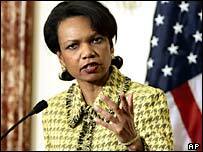 Condoleezza Rice - who has recalled the US ambassador to Syria - said she was not blaming the attack on Syria but its presence in Lebanon was destabilising. The United Nations condemned the attack and Secretary General Kofi Annan urged Syria to withdraw its troops. Thousands of mourners are expected at Mr Hariri's funeral on Wednesday. Lebanon's interior ministry said Mr Hariri was "almost certainly" killed by a suicide bomb, amid widespread fears the attack could signal a return to the violence of the country's civil war years. US Ambassador Margaret Scobey delivered a message to the Syrian government expressing US outrage over Mr Hariri's death, before returning to Washington for "urgent consultations". Ms Rice said the US was discussing a response to the bombing with the UN, and considering further diplomatic sanctions against Syria over a range of US complaints. She told a news conference: "The Syrian government is unfortunately on a path right now where relations are not improving, but are worsening. State department spokesman Richard Boucher said the US was not blaming Syria directly for Mr Hariri's death. But he said the incident underlined what he called the distortions caused by the presence of 14,000 Syrian troops in Lebanon. The United Nations Security Council unanimously condemned the bombing and called for the perpetrators to be brought to justice. Mr Annan said he had recently written to Syrian President Bashar al-Assad, to urge him to comply with a UN resolution calling for the withdrawal of foreign troops from Lebanon. Lebanese opposition figures have blamed Mr Hariri's death on the government and Syria, and have renewed calls for Syrian troops in Lebanon to leave. Mr Hariri died when a bomb exploded near his motorcade in Beirut on Monday, killing at least 15 people and injuring about 120 others. 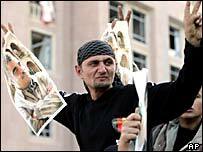 His funeral will be held on Wednesday at a mosque in central Beirut. His family has called for a large popular turnout, but it has also said it does not want members of the government to attend. Security operations have been stepped up in anticipation that tens of thousands of mourners will attend. It follows noisy street demonstrations in Beirut on Tuesday and clashes in Mr Hariri's hometown of Sidon, southern Lebanon, which left several Syrian workers injured.